One of the Lau Brothers. When old school kung fu fans talk about their "golden age" of HK films, the name of Lau Kar Fai (as he was known then) is certainly almost always near the top of the list. His work with his adopted brother and director, Lau Kar Leung, is legendary and the image of Lau Kar Fai's shaven head is one of the enduring images of that period. He and many of the films he was in " 36th Chamber of Shaolin, Return to the 36th Chamber, Dirty Ho, Legendary Weapons of China, Cat vs. Rat, Eight Diagram Pole Fighter are all considered kung fu classics and show Lau at his best. His physical skills are incredibly impressive. He started learning kung fu in his early teens when he skipped school behind his parent's back to go learn and train at the kwoon of Lau Charn a Wong Fei Hung grand student and father of Lau Kar Leung and Wing. Lau Charn's wife also helped in the training and somehow the young Xian Qixi/Sin Gum Hei (Gordon's real name in piyin) got close to her and that's how he was introduced into the family and eventually was adopted into it and received the name Lau Kar Fei. As he grew into adulthood he found a job as a shipping clerk, but that was probably just a way to earn a living while his real interest was kung fu. Besides kung fu he was also adept in dancing, singing and playing guitar (as seen in My Young Auntie). Eventually of course Lau Kar Leung was to ask him to act in one of his films. With the decline of the kung fu genre in the early 80's his career began slipping as well, but he has continued making films until the present time. Cahier du Cinema has called Gordon the greatest or best kung fu actor ever. 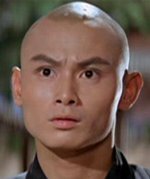 Generally using the name of Gordon Liu after the kung fu period ended and often a full head of hair, he has most often been cast as a bad guy. Some of his post kung fu films are the classic My Heart is that Eternal Rose, Tiger on the Beat, Killer Angels, Last Hero In China (he has that wonderful duel with Jet Li on the drawbridge), Treasure Hunt and in 1999 he appeared with Anthony Wong in Heaven of Hope.